This is the month that things start changing big-time in the Marvel Universe. Mutants are becoming an endangered species, Tony Stark’s financial situation goes topsy-turvy and one of Marvel’s grimmest loners is getting some unwanted help. Even though Secret Wars won’t be over for a little while, fans of the Marvel Universe are going to start seeing the aftermath of the big crossover event when Marvel relaunches a slew of returning and debuting characters in new series. Some of the status quo shifts will be first seen in two new comics coming this week. 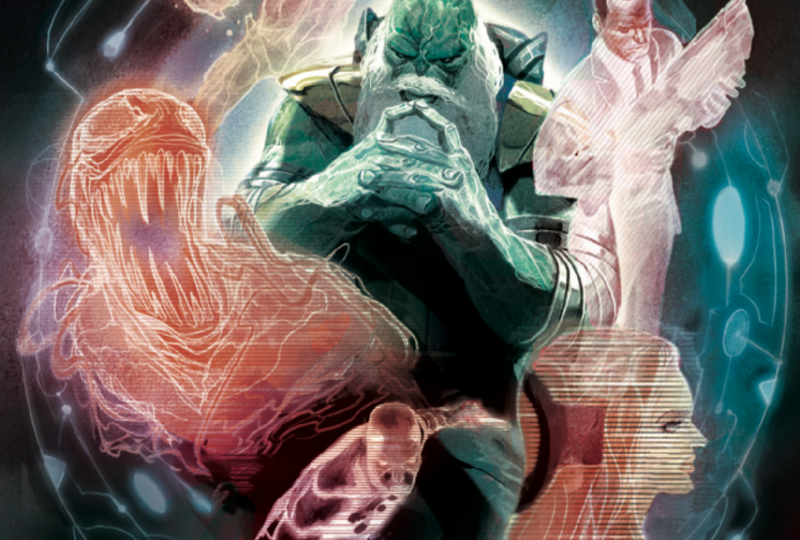 All-New, All-Different Marvel Point One and Avengers #0 both take a look at huge swaths of the post-Doom-dominated existence coming our way and each issue has a few tantalizing nuggets of what’s coming down the pike. The new term being bandied about for Marvel’s collection of alternate Realities is the Omniverse. The narrator of All-New, All-Different Marvel Point One calls it that on the first page of that comic’s framing story, set on the remnants of the planet that Dr. Doom created as a last bastion of infinite realities. The word “omniverse” also get thrown out in a sequence from a preview of the next Ultimates book, too. Someone looking to learn the ropes from the Man Without Fear? This looks like it’ll be new territory for Matt Murdock. Back in the 1970s, Daredevil fought crime alongside then-girlfriend The Black Widow. She was more of an equal, though, and not a sidekick. And while Daredevil’s no stranger to team-ups and temporary crimefighting partnerships, he’s not really wired for being a mentor. The protege-to-be is named Sam and his combo of super-science know-how—in the form of a stealth suit that makes him invisible— and illegal immigration status seems geared to making him a big part of Matt Murdock’s life moving forward. One of the many Earth’s Mightiest teams won’t be officially sanctioned. The Avengers Idea Machine squad headed up by Robbie DaCosta is a re-invention of the evil Advanced Idea Mechanics operating in international waters. The American government’s not too happy about that and a dude who looks a lot like General Thaddeus “Thunderbolt” Ross is ready to aim a giant mutant monster right at them. Her main power is to steal the lifeforce and special talents of others. And now Rogue’s life is on the brink of ending, thanks to a run in with the traveling mutagenic cloud that unlocks metahuman potential in people with Inhuman DNA. This cruel irony will likely be a focal point of the new Uncanny Avengers title. Remember how there were teases about some sort of shift in the status of Avengers funding in this summer’s free Avengers comic? A throwaway line in Avengers #0 sheds a little more light. There’s a really poignant reason that Ultron’s “son” is getting rid of the thing that makes him almost-human: he remembers everything. And the perfect recall extends to feelings associated with those past events. The onrush of sensations are making it hard for the Vision to save lives. So he does the logical—and extremely sad—thing. The first new Marvel #1s roll out this Wednesday and there are sure to be more changes coming.